L’Oréal has bought ModiFace, an augmented reality (AR) and artificial intelligence (AI) company, as the French beauty brand expands into technology. The FMCG giant, whose 34 brands include Maybelline and Lancome as well as its namesake beauty products line, did not disclose financial terms of the acquisition. This move marks L’ Oréal’s first tech acquisition in its 109-year history and the first time a Fortune 500 beauty company has acquired a major technology company. ModiFace uses artificial intelligence technology to let users render various skin, makeup, and hair effects with mobile apps that track facial features using video or photo capabilities. In essence, it allows people to try out a hairstyle or try on lipstick without physically trying them on. 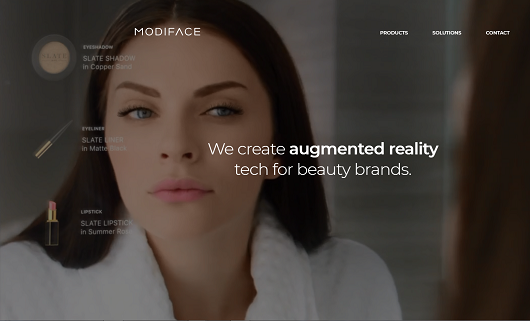 “When it comes to beauty Augmented Reality, ModiFace is the definitive leader in the beauty industry, powering numerous applications including Sephora’s Virtual Artist, L’Oreal’s Style My Hair, and many other AR applications,” said Aarabi, who will retain his position as ModiFace’s CEO. Since its creation 11 years ago, ModiFace’s technologies have been used by more than 100 brands. ModiFace currently employs approximately 70 engineers, researchers, and scientists, whose output comprises over 200 scientific publications and 30 patents. For example, L’Oréal’s Style My Hair is a mobile app that allows users to realistically live-test various hair colours. The technology used by ModiFace was developed using a “mixed-type deep learning model,” that ModiFace employees manually annotated 220,000 facial images for, training the neural network to detect the shape and structure of hair. “The combination of the leading beauty tech company and the world’s largest beauty company will bring about many interesting advances in AR and soon [artificial intelligence (AI)],” said Aarabi. Stéphanie Binette, Vice President and Chief Marketing Officer of L’Oréal Canada, said that ModiFace will join L’Oréal’s Digital Services Factory and benefit from L’Oréal’s “century-old expertise in beauty, [research and innovation (R&I)] and marketing,” and its external open innovation network. Through new technologies such as AR, AI, and voice enabling, ModiFace will work with L’Oréal’s 34 brands to pioneer new innovations such as makeup and hair colour try-ons, shade finders, skin care diagnostic tools, and AI projects developed around beauty. “ModiFace technologies based on augmented reality and artificial intelligence will be key to make the shopping experience of the future more fun, effortless and personalized,” said Binette. How does is the agency ecosystem changing? Organizations like L’Oréal, Unilever and P&G are all wrestling with the best way to bring in the talent and capabilities needed to drive change. For campaigns they’ve historically relied on the creative agency model, but when it comes to technology have found that digital has stretched the effectiveness of that approach. Unilever has taken a similar approach. Ten years ago their “Unilever Ventures” investment fund started taking key positions in tech firms like the BrandTone mobile business that could give a competitive edge. Later Unilever made an aggressive play in the start-ups market several years ago, forming their “Foundry” group that acted as a matchmaker between brands and start-ups. The Collider accelerator for early stage start-ups was one of their notable partners for helping the massive CPG firm overcome the challenge of how to scale young businesses and benefit from young tech talent. Since then they expanded to create the Unilever Studio to reduce content production costs and increase production capabilities in the content-hungry digital channels. What are the implications for tech start-ups? L’Oréal’s approach of complete acquisition is more absolute and suggests this capability has become central to their strategic plan. There is both a massive economy of scale in owning the tech channel, but also a satisfying ability to block beauty competitors out from access to one of the leading augmented reality/virtual reality platforms. For digital start-ups in the AR/VR space, this will put a premium on their pricing as they look for trade sales to L’Oréal or its competitors.